I added this to my portfolio of investment trusts earlier this year - here’s a link to the post. Its investment policy is to protect and increase (in that order) the value of shareholders' funds per share over the long term. Yesterday, they issued results for the half-year to 31st October 2013. Over the six months period, NAV per share fell by 4.9% to £334.75 compared to a rise of 5.8% in its comparator, the FTSE All-Share Index. PNL's share price fell by £20.40 to £336.60 over the same period, being a premium of 0.6% to the Company's NAV at that date. As the markets have risen quite a bit over the past year or so, I thought it would be a good plan to park some of the gains from a couple of share sales in a safe haven. I was not expecting a great share price surge from my holding but I must admit to being disappointed to be down around 3.5% since purchase. In my earlier post I said "I also like the concept of not losing money. I am reminded of legendary investor Warren Buffett’s investing rules - Rule 1, never lose money. Rule 2, Never forget Rule 1" mmm…. Of course, four months is too soon to reach a judgment but I note from the report that the 3 year performance has not been too good - "Over the three years to 31 October 2013 the NAV rose by 10.5% compared to the FTSE All-Share Index's rise of 22.1%. This underperformance of 9.5% is equivalent to 3.3% per annum over the three year period". 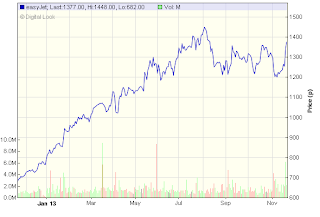 I will be looking to see some signs of the share price making progress over the coming months. This FTSE 100 firm has not appeared on my radar until this weeks final results caught my attention. Pre-tax profits for the year came in at £478 million, up over 50% on last year. The company are proposing a final dividend of 33.5p (last year 21.5p) based on its existing policy of paying out one third of annual profit after tax. In addition they will also be paying a special dividend of 44.1p representing a return to shareholders of £175m. Payment will be made on 21st March 2014. 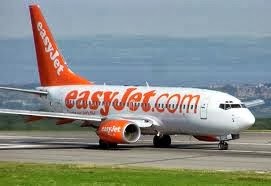 "easyJet has delivered a strong full year performance and made significant progress against executing its strategic priorities. The results reflect easyJet's continued structural advantage in the European short-haul market against both the legacy and low cost competition. Our disciplined approach to capacity allocation has resulted in a meaningful growth in earnings, profit margin and return on capital employed and we have ended the year with a strong balance sheet and a low level of gearing. As evidence of our continued confidence in the future prospects of the business the Board has recommended to return £308 million to shareholders through the combination of an ordinary and special dividend. We will continue to deliver our strategy of offering our customers low fares to great destinations with friendly service so that we can continue to win in a more competitive market. This means we are well placed to continue to deliver sustainable returns and growth for our shareholders." The company has further strengthened its capital position - as at 30 September 2013, easyJet had cash and money market deposits of £1.2bn, an increase of £354m on the previous year and net cash of £558m against net debt of £74 million at the same period last year. The share price has performed strongly over the past year and since the results were announced, it is up over 100p so I would not be surprised to see some pull back in the coming weeks. On a current p/e of 14, I believe the shares are still reasonable value and I have therefore made my usual ‘half’ purchase today at 1409p giving a prospective yield of 5.5% subject to approval of shareholders at the AGM next February. Last Friday my alert for a possible purchase below 340p was triggered. This has been on my watch list for some time. 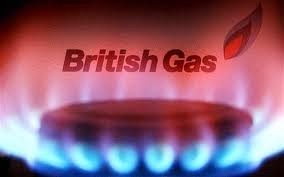 Centrica owns British Gas, the "downstream" business providing gas and electricity to consumers. British Gas is the UK's leading energy supplier, and serves around 12 million homes in Britain – nearly half of the country's homes – as well as providing energy to one million UK businesses. Centrica Energy's portfolio of both on and offshore wind farms is capable of producing enough electricity to meet the needs of over 400,000 homes. Their 270MW Lincs offshore wind farm achieved first power last year and became fully operational in September 2013. Centrica operate a fleet of six Combined Cycle Gas Turbine (CCGT) power stations across the UK. The latest, completed in 2010, is at Langage in Devon. Rated at 895MW, it is one of the most efficient generators of its type in the world. In 2009 they completed a deal with EDF to acquire a 20% equity interest in EDF Energy Nuclear Generation , the operator of eight existing nuclear power stations in the UK. This was, in part, funded by the sale to EDF of Centrica's 51% equity stake in the Belgian business SPE. Direct Energy, its US business, is one of the largest providers of electricity, natural gas and related services operating in 10 Canadian provinces and 46 U.S. states plus the District of Columbia., servicing the energy needs of 6 million customers. It owns and operates 4,550 natural gas wells in Alberta, Canada, and has three gas-fired power plants and power purchase agreements totaling 813 megawatts of wind power, in Texas. Centrica's LNG announcement in March places it at the heart of a global shift where North American resources will play a larger role in the energy supply market, this means they are in a position to help customers manage the pricing and use of energy to their advantage. As we all know, the big 6 energy companies have been in the spotlight in recent weeks. Firstly, Labour are promising to freeze energy prices if they get elected in 2015. Secondly, all have recently announced above-inflation energy price rises for the coming year. Centrica delivered a slew of bad news last week as it issued a profits warning and said the political row over energy prices meant it was now less likely to invest in new UK power plants to keep the lights on and despite implementing a 9.2% price rise, profits would most likely be the same as last year, not the 4% increase previously forecast. As a result the share price has tumbled from a recent high point of over 400p to an 11 month low of 336p on Friday morning. Although the share price weakness could continue for some time, I believe the long-term outlook is not as bleak as is currently being painted. 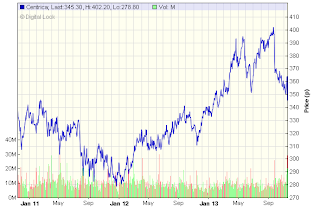 Centrica is a large diversified energy company with a market cap. over £17bn. I am hoping that all the bad news has been factored into the reduced share price - but expect price volatility for quite some time - and I have therefore decided to add CNA to my ISA portfolio at the purchase price of 337p. Digital Look forecast profits of £2.53bn and a dividend of 17.3p for the coming year giving a forward yield of just over 5% and cover of 1.6x earnings. They are due to release Preliminary Results for the year ending 31st December on 20th February 2014. In late 2008 when deposit account interest rates started to decline from the heady heights of 6%, I started to look around for alternative ways to generate income. I looked at some of the permanent interest bearing shares (PIBS) offered by the likes of the Coventry and Nationwide and liked what I saw and so bought some to add to my fixed interest portfolio. The Nationwide PIBS I selected were their 7.971% (NABA) which is due to be called (redeemed) in March 2015. If this is not called, the reset rate is the prevailing gilt rate + 4.45%. The second one I selected was their 6% (NANW) - call date December 2016. The purchase price of both was significantly lower than their current prices and I have enjoyed a handy 8% average income. 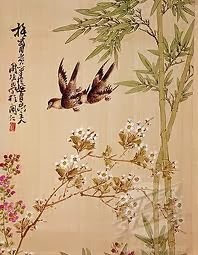 Of course, to achieve a higher income, I have moved up the risk ladder - the higher income (as well as capital) is only as good as the institution issuing the security. PIBS holders rank behind all other lenders and depositors in the queue for repayment should the institution fail. They are also non-cumulative, so any unpaid coupons do not have to be made up later. 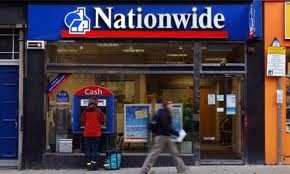 Nationwide is the UKs largest mutual building society and Britain‘s 3rd biggest mortgage lender. The Society has recently issued results for the 6 months to end September 2013. Looks like the year is off to a strong start with income up 25% to £1.39bn, statutory profits up162% at £270m and core tier 1 ratio (a measure of financial strength) up from 12.3% to 14.2%. (The Coventry BS is the highest at 22.5%, Barclays Bank is currently 11.3% and Lloyds Bank 9.6%). "We have continued to play a leading role in the financing of the housing market, consistent with our role as the UK's largest mutual building society: our gross mortgage lending is up 37% at £14.0 billion, a market share of 15.4%, and our net lending is up 75% at £5.6 billion. This represents our highest six month lending period for five years. We have placed a particular emphasis on supporting first time buyers, helping 30,400 into a home of their own, representing support for more than one in five first time buyers. We have balanced our mortgage growth with an inflow of retail savings and we have increased our deposit balances by £5.4 billion, with a primary focus on rewarding customer loyalty". I feel reassured with these results following all the problems this year with the other mutually owned bank - Co-operative (less said the better). I last posted on HFEL back in April following the half-year results. They have today issued full year results to end August 2013. HFEL seeks to provide a high level of dividends, as well as capital appreciation over the long term, from a diversified portfolio of investments - currently around 60 - traded on the Pacific, Australasian, and Indian stock markets. Building on last years total return of 8.8%, the Company have reported a share price total return increase of 11.9% compared to the benchmark index increase of 9.9%. HFEL is the highest yielder of my 3 Asia-focussed investment trusts. Over the year, dividends (paid quarterly) have been lifted by 6.3% from 16p to 17p giving a yield of 5.2% at the current price of 328p. The dividend was comfortably covered by revenue income of 18.05p per share and the surplus has further strengthened reserves which currently stand at 96% of dividends paid in the past year. Welcome news on charges - Henderson have agreed to take a reduction in their annual management fee from 1.0% to 0.9% of the total value of the fund's net assets - there is no performance fee. Fees and expenses for the past year were £4.5m - just under 1.4% of NAV. I hold this investment trust in both my ISA and SIPP Drawdown portfolios and recently topped up my holding following a dip in the share price after news that the manager Neil Woodford was to leave Invesco (here’s the link). Over recent weeks the price has been slowly recovering and today is 583p. They have today issued half-year results for the period to 30th September 2013. 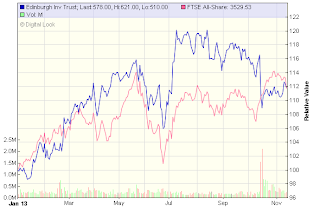 Share price total return has advanced by 7.2% compared to the FTSE All Share benchmark index gain of 3.8%. The Board has declared an unchanged first interim dividend of 5.0p which will be paid on 29 November 2013 to shareholders on the register on 22 November 2013. The current yield is 3.9%. 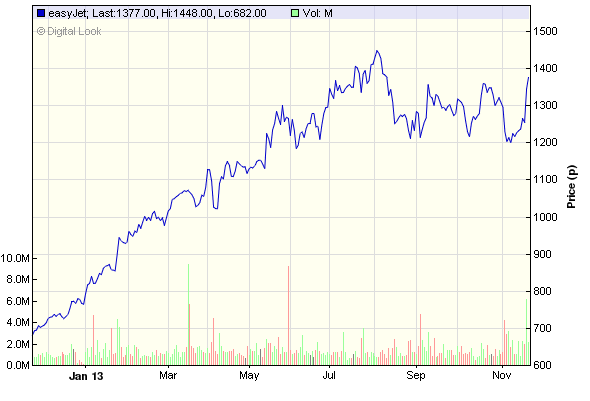 Revenue return is up 7.1% over the past 6m at 12.1p per share - not quite covering the 12.8p paid in dividends. A performance fee is payable in respect of each three year rolling period in which the Company outperforms its benchmark index plus a hurdle of 1.25%p.a. This fee is capped at 1% of the period end net assets, before deduction of the fee. As the Company has performed strongly in the two and a half years to 30 September 2013 in comparison to the Index, the trust are liable for payment of a chunky capped fee of £11.7m. As I have said in relation to other trusts, I am no fan of these fees - I think it would be more acceptable if the fees could be clawed back during periods of any under performance. Having said that, I knew the charging structure before purchasing so I am not complaining. The board have had discussions with Invesco but are still to make a decision regarding the future management of the trust. Should they decide to stick with Neil Woodford they will need to give 3 months notice to terminate the current arrangements. The other option would be to stay with Invesco and hand over the lead management to the likes of Mark Barnett who will be taking over as manager of Woodfords funds when he departs next April. “The holdings in Centrica and SSE fell in value towards the end of the period, on the back of the 20 month utility bill price freeze proposed by the Labour Party should they win the next general election. This policy would clearly be popular with the electorate but the economics of it are in our view absurd. We believe it is irrational for any privately-owned company to sell its products or services at a loss and we would encourage any company that was forced to do so to simply stop supplying. Furthermore, energy bills have been increasing in recent years due to higher commodity prices and as a result of policies designed to increase the UK's sourcing of energy from renewables. Prices have not increased through company profiteering - there have been 20 separate inquiries into the energy market since 2001, none of which have found evidence”. The trust holds SSE and British Gas owner Centrica. Concluding his outlook, Woodford cautioned that "returns over the next three years are likely to be somewhat lower than over the last three years, purely as a consequence of the higher valuations that we now see in our market." 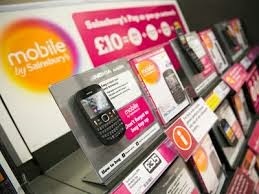 Sainsbury have today announced half-year results for the 6m to end September 2013. Sales and profits continue to impress and have been boosted by growth in own-brand food which is moving ahead at twice the rate of branded goods, and even faster growth in their range of non-food goods such as general merchandise and clothing. Profit before tax is up 9.1% to £433m (2012/13: £397m) whilst basic earnings per share is up 8.5% to 17.9p (2012/13: 16.5p) aided by a reduced corporation tax levy. The Board has proposed an interim dividend of 5.0p (2012/13: 4.8p), up 4.2% year-on-year. This is in line with their policy of paying 30% of the prior year's full-year dividend as an interim dividend. "Our share of the grocery market is the highest for a decade at 16.8 per cent following 35 consecutive quarters of like-for-like sales growth. We are helping customers Live Well for Less through high-quality, affordable own-brand products, Brand Match, Nectar and targeted coupon-at-till promotions. "Whilst customers' budgets remain tight and any recovery in the economy may take time to take effect, our consistent strategy and strong values-driven culture mean we are well placed to continue to deliver for customers, colleagues and shareholders." On the new business front, they recently launched a new mobile phone network - Mobile by Sainsbury's - a joint venture with Vodafone, offering high-quality, value-for-money mobile phone tariffs and handsets. SIM cards are now available in all stores, with 300 stores also offering a range of handsets. The results have been well received by the market and in morning trading the share price was up 4% at 415p. 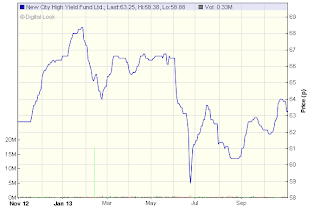 I have a figure of 17.6p pencilled in for the full-year dividend which would give a forward yield of 4.2%. More on this one following the Christmas trading update in early January, but happy to continue holding. In a previous post back in May, the portfolio was showing a return of just 8% compared with the FTSE 100 being up around 15% and my investment trust portfolio returning 16%. 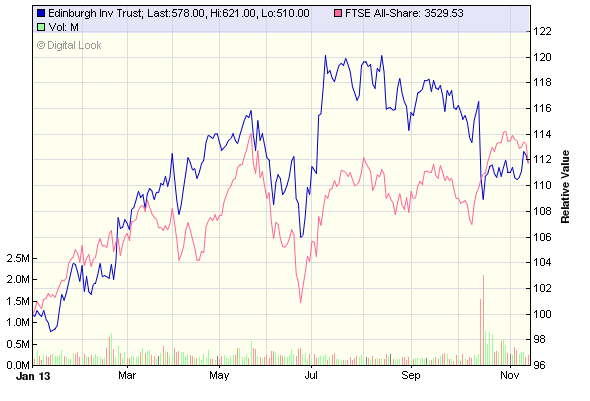 I was more or less decided to give up on the shares and transfer to investment trusts. In subsequent weeks and months I disposed of Aberdeen Asset, DS Smith, Greggs, Dialight, Pearson and RPC Group. Looking back, I now regret having disposed of DS Smith and RPC Group - they are still on my watch list with a view to possible re-purchase at some point. Dialight has had a bumpy ride and is currently down nearly 20% at 950p - I have an alert to consider buying back in should the price dip under 900p. The proceeds were recycled into a number of ITs - Aberdeen Asian Income IT, Finsbury Growth & Income Trust, Vanguard All World High Yield ETF and Personal Assets Trust. Of course, as soon as I am more or less decided on one course of action, I start to think I will miss the individual shares portfolio and in recent weeks I have purchased shares in AIM-listed drinks maker Nichols and retailer Next. "You get into the office, boot up your computer and think ‘I’ll just have a quick look how the portfolio is getting on this morning’…… and then proceed to have a quick look every hour after that. Such an obsession with share prices will do more harm than good as it is likely to either induce you into trading too much or convince you that the market is right and there’s some bad news waiting around the corner for a share which you had convinced yourself was in perfect health. Forget about share price fluctuations, speculation and other noise and keep focused on fundamentals." Of course, individual shares are more volatile than collective investment vehicles like investment trusts and exchange traded funds. They are also widely covered by analysts and media pundits and there is often a great deal of conflicting opinion on discussion boards and blogs! All this additional information can contribute to uncertainty and result in making rash decisions. Maybe writing regular posts for this blog is not conducive to making sensible investment decisions! Here’s the portfolio showing current valuations and including dividends accumulated since January. The disposals are indicated (S) and their ‘current price/value’ represents the net sale proceeds not the value of the shares at current prices. 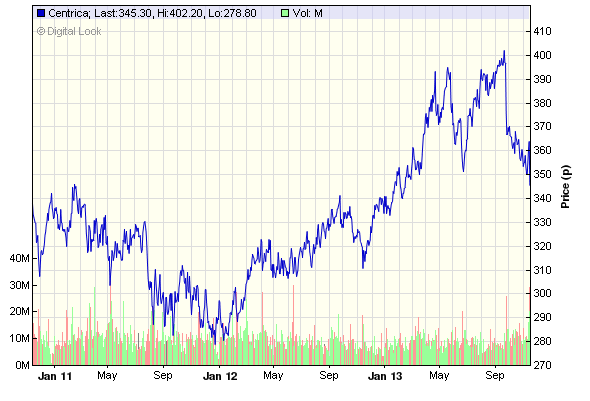 Total return on the FTSE 100 is up around 15.5% since the start of 2013 at 6,708 (incl. dividends), so the portfolio is still a little short of the returns I may have received in a basic FTSE 100 tracker but certainly a big improvement on May. 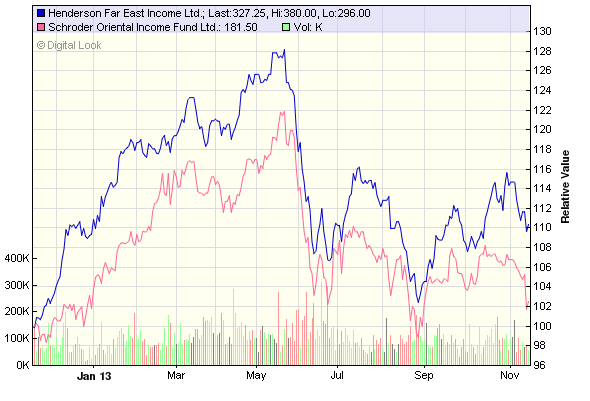 This is one of my long-standing income trusts providing exposure to the Far East and Australian markets. I last updated on SOI after the half-year results in May. Yesterday, they issued results for the full year to end August 2013. Following on from last years return of 12.3%, net asset value total return for 2013 has increased by 15.6%, well ahead of the benchmark index of 11.3%. The dividend has been increased by 9.5% from 6.8p to 7.45p. A final dividend of 3p will be paid 29th November. 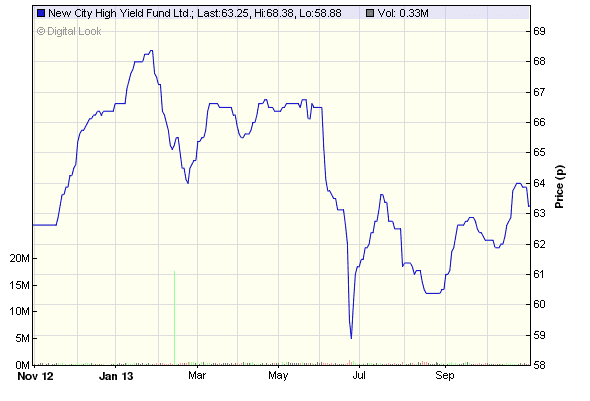 Based on the current share price of 188p, the yield is 3.9%. 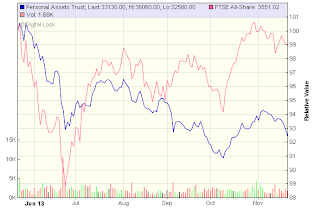 Net asset per share have increased 10% from 165p to 181.4p. 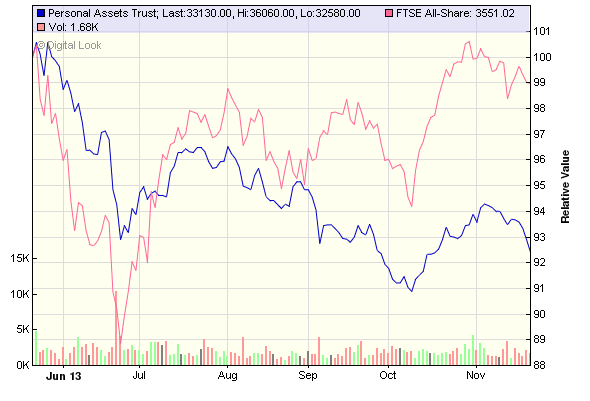 Over the past year the trust has continued to issue a total of 14.9m new shares at a slight premium to NAV (2012 - 9.5m). Furthermore, in June, the Company successfully completed a "C" share issue and 50.85m shares were issued, raising a total of £50.8m. 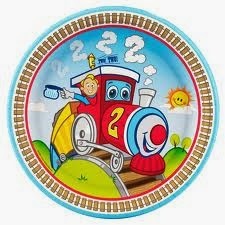 The "C" shares were subsequently converted into 27.2m ordinary shares on 1st July 2013. As a result, the net assets of SOI have increased some 36% from £290m to £396m. Of course, management fees correspond to the value of net assets and these have risen from £3.5m (2012) to £5.1m this year including a chunky performance fee of £2.4m. Ongoing charges are around 1.6% which is probably the going rate for this sector but at the top end of what I like to pay. I am not a big supporter of performance fees and many trusts are opting to remove them from their charging structure. The basic fee is 0.75% of the net assets. The Manager is also be entitled to a performance fee of 10% of the amount by which the adjusted net asset value at the end of the relevant calculation period exceeds a hurdle of 107% of the adjusted net asset value at the end of the previous period multiplied by the time weighted average of the number of shares in issue during the year. The portfolio is spread far and wide - the main areas for investment are Australia 25%, Singapore 18%, Hong Kong 16.5%, Taiwan 13%, Thailand 9.3% and China 9.2%. "There are some big questions facing Asia, as is usual in the wake of a significant correction in the regional markets. There are doubts surrounding growth and some of the regional currencies, but the most significant is the pace and extent of a US led tightening in credit conditions. A stronger US dollar and perception of tighter money are never good for Asian asset values, and it is difficult to paint a positive near-term picture. The concern over tapering may have been overdone in the short-term, but to an extent the genie is out of the bottle and will not be easily put back in. We are in an uneasy market phase where the best of liquidity is behind us, but earnings growth support is unclear. However, one should not lose sight of the fact that if higher US treasury yields are a harbinger of economic spring for the global economy, then plenty of Asian companies and markets stand to benefit." I am happy to continue holding for now, especially if they maintain the above-inflation growth in dividends but will keep a close eye on charges. It will be interesting to compare the performance with Henderson Far East Trust which is expected to report its results in the next week or so. NCYF invests in high-yield fixed-interest securities and has produced positive NAV total returns in each of the past four years. They have recently issued full year results (not sure why it takes four months?) to end June 2013. Net assets have increased 19% from £124m to £147.8m. It has also grown its dividend from 3.57p in 2007/08 to currently 4.1p for the year to the end of June 2013, to a give a yield of 6.4%, paid quarterly. It should also be of note that the dividends are paid entirely out of income received by the Company with no element of capital included. The Company's net asset value per share rose by 7.4% to 60.53p during the year; when this capital measure is adjusted for the payment of dividends of 4.1p, the net asset value total return was 14.9 per cent. Dividends have been more than covered by earnings of 5.42p per share and revenue reserves have increased to the equivalent of 16 months current dividend distribution. As in previous years, the trust continues to trade at a premium to net assets and the management have raised £15m via the issue of new shares - equivalent to 10% of the Company’s share capital and this has helped to reduce the percentage of ongoing charges for the year from 1.21% to 1.18%. This is, of course a percentage of net assets and in real terms, total expenses increased from £1.5m to £1.74m. The trust has a widely diversified portfolio, including some high-yielding convertibles and equities, with useful exposure to floating-rate notes to guard against inflation. I have held this trust in my SIPP for the past 3 years and it forms part of my bonds and fixed income allocation along side my Coventry Building Society PIBS. The charges are a little on the high side but the returns are satisfactory and it provides an element of diversification.